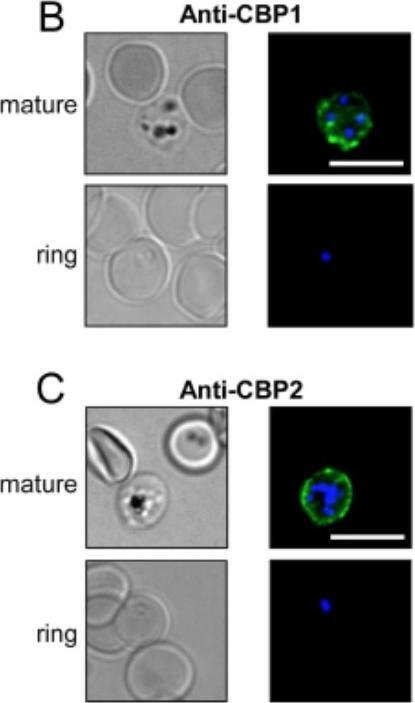 The antibodies raised against CBP1 and CBP2 stain the external membrane of RBC infected by mature 3D7 Plasmodium falciparum strain. (B,C) 3D7-iRBC were visualized by transmitted light, by staining with anti-CBP1 (B) or anti-CBP2 (C) antisera (green) and by Hoechst staining (blue) using either RBC infected by 3D7 strain at mature stages (80% parasitaemia, after gel flotation) or at early stage (4,5% parasitaemia, 4% ring). Bar = 10 μ m.Hermand P, Cicéron L, Pionneau C, Vaquero C, Combadière C, Deterre P. Plasmodium falciparum proteins involved in cytoadherence of infected erythrocytes to chemokine CX3CL1. Sci Rep. 2016 6:33786.